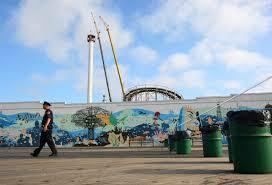 Expectations for a great business day in the renewed Coney Island Amusement Park were seriously dashed as workers dismantled a tottering tower that had been threatening to topple over. Some estimates predict that receipts may have been down by as much as 50 percent as the city was forced to close down Luna Park and Deno’s Wonder Wheel Park on Tuesday afternoon out of worry that the overly swaying Astrotower could come crashing down. Both parks were shut down until 3pm on Thursday, July 4, Coney Island’s undisputed busiest day of the year. Crews of demolition workers took down 53 feet, or about 44,000 pounds of the steel tower, a futuristic ride which had stood 275-feet above the street in the old Astroland Park. The tower-ride brought people to the top for the magnificent view of the Atlantic Ocean, New York Bay and the surrounding sights. The dismantling of the tower was concluded many hours after the end of the fabled hot-dog-eating contest hosted by Nathan’s Famous Hot Dogs, a tradition held each year which attracts massive numbers of visitors to the iconic beach and amusement park. “It’s absolutely heartbreaking. It’s crazy that this happens right before the Fourth of July” said Dianna Carlin, owner of Lola Star boutique, who estimated losing 50 percent of her profits. “Can’t Coney Island get a break?” she added, referring to the disaster Hurricane Sandy left behind. The co-owner of Deno’s Wonder Wheel Park, Dennis Vourderis, was relieved when he was finally told he could re-open his business. Alex Guzman joins Gowanus Lounge as an enthusiastic sportsman. He can write on almost any activity if it involves movement, from dance to basketball; from golf to hockey. Born with a love of sports that knows no bounds, Alex is an enthusiastic contributor on the world of Brooklyn sports. Alex can be reached at alex(at)gowanuslounge.com.